Mod: Three stories for you today. We'll kick this one off with some CalPERS news from Transparent California. CalPERS paid out over $20 billion in benefits last year as ‘100K club’ grows to nearly 23,000, new data shows (Transparent California link): Today, TransparentCalifornia.com — the state’s largest public pay and pension database — released 2016 pension data from the California Public Employees’ Retirement System (CalPERS). The data reveal that CalPERS made 646,843 individual payments totaling over $20 billion last year, with 22,826 retirees earning pensions of over $100,000 — a 63 percent increase since 2012. Former Solano County administrator Michael Johnson: $390,485. Former Los Angeles County Sanitation District GM Stephen Maguin: $345,417. Former UCLA professor Joaquin Fuster: $345,180. The average pension for a full-career CalPERS retiree was $66,400. With the recent addition of CalPERS data, TransparentCalifornia.com now has over 1.1 million pension records from 33 California public pension plans. Statewide, at least 52,963 retirees collected pensions of at least $100,000 last year, according to the data. The continual rise in pension costs demonstrates the importance of making this information public, according to Transparent California research director Robert Fellner. 10 percent of Pasadena’s retirees make $100,000 or more in annual pensions (Pasadena Star News link): Roughly 10 percent of Pasadena’s retirees earned at least $100,000 from annual pensions through the state’s retirement system in 2016, according to a report released Wednesday. Transparent California, a government watchdog group, ranked cities, including Pasadena, Riverside, Long Beach, Anaheim and Torrance, among the 25 public agencies with the most pensioners receiving six-figure retirement income in the state. Pasadena, at No. 20, has 149 retirees collecting at least $100,000 in benefits a year. The number of retired public employees with pensions of at least $100,000 has grown 63 percent statewide since 2012, the group found. The average pension for a “full-career” retiree under the California Public Employees’ Retirement System better known as CalPERS was $66,400 statewide, about $15,000 less a year than in Pasadena, according to Transparent California’s data. Pasadena Mayor Terry Tornek did not find the numbers shocking as the payouts are in line with other large cities, such as Burbank and Glendale. He attributed Pasadena’s ranking to the city’s efforts to stay competitive. Now facing deficits, Pasadena anticipates significant leaps in pension obligations — from $30 million to $80 million per year — in the next two decades. Still, Tornek said Transparent California’s ranking doesn’t factor in cost reductions over the years as labor groups, particularly police and fire, took salary cuts in exchange for maintaining higher pension payouts. In Pasadena, residents have high expectations about the services they receive, he said. Mod: Well, there you go. Pay out six figure pensions or grandpa dies. Mayor Tornek makes it sound a bit like ransom. Or blood money. The Pasadena list is here. Little Loyalton California became quite famous this week for its CalPERS woes. There were many news articles telling their sad story. The Los Angeles Times filed the best one. This tiny Sierra Valley town voted to pull out of CalPERS. Now city retirees are seeing their pensions slashed (Los Angeles Times link): The tremor in John Cussins’ right hand worsened as he described restless nights haunted by worries about paying the bills. After suffering a stroke in 2012, he retired as a 21-year employee of the city of Loyalton, Calif., where he oversaw the town’s water and sewer systems. Cussins, 56, believed his city pension and the Social Security payments he and his wife received would bring in enough to provide a decent retirement in the tiny, old timber mill town in the Sierra Valley. Then a letter arrived in October. The California Public Employees’ Retirement System was cutting his $2,500-a-month pension by 60 percent, bringing it to about $1,000 a month. Loyalton’s four retired city employees became the first in California to see their pensions sliced by CalPERS because of a city defaulting on its payments to the fund, but hundreds of other government retirees across the state may soon face a similar fate. At the same time, financially strapped local governments that considered pulling out of the state pension system, some hoping to find more affordable alternatives, have found it next to impossible to do because of the large termination fees they must pay CalPERS if they do. As the nation’s largest public pension fund, CalPERS manages a $300-billion retirement system that services more than 1.8 million members and a retiree healthcare program that serves close to 1.4 million more. CalPERS functions as a money manager, investing the funds paid into the system by state and local governments. 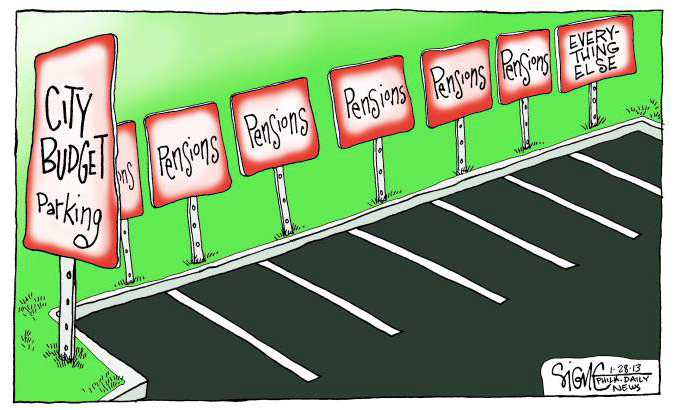 But those governments decide what pension benefits they will provide their employees and are ultimately responsible for ensuring there is enough money in their pension funds to provide the benefits promised. Cussins was a member of the Loyalton City Council when the pensions were cut, but he said he had no idea it was coming. More than three years before he was elected, the council voted to pull out of CalPERS when its last pension-eligible employee retired, deciding the monthly payments were too steep for a town that for years flirted with insolvency. CalPERS levied a $1.66-million termination fee on the city. Loyalton, home to about 760 people, has a single full-time city worker and an annual budget just shy of $1 million. The city didn’t pay the fee, so the four retired city employees saw their pensions slashed in November. Mod: There is some intriguing information further on in this Times' article dealing with the unfortunate fate facing those cities that attempt to quit CalPERS. It ain't a pretty picture. As an example, bankrupt Stockton debated getting out, but when faced with a $1.6 billion dollar penalty decided they really ought to rethink the notion. Golden handcuffs, as they say. Unbelievable! With gold being around $1290.00 an ounce, those golden handcuffs ought to be worth a pretty penny! Now I know when I was looking for my first job Grandma said, Try to get a government job or work for the city honey. 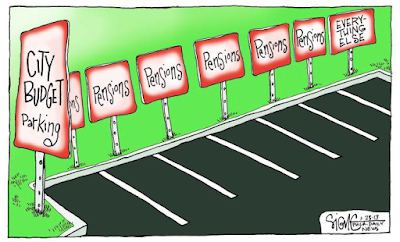 Politicians and pensions, that's what California is good for. Burglars take notice, you want to score some loot, Google the neighborhood for city and government employees. Good time for contract services to pitch their responce times and certifications. Cities and towns need to remain solvent, if golden handcuffs by CalPERS cause restraints; time to turn to options that work. CalPERS is singlehandedly keeping Winnebago in business. Want to know where the CalPERS retirees live? Look for the big old Winnebago. When contracting out services, two year renewable contracts; keep the expenses down by keeping competition in the marketplace. We all pay omage to Sacramento; we voted these people into service, by not reading the small print, "we" all checked the voter box for "stupid". I have no problem with pensions and retirements for employees, just not the system of CalPERS set up by Sacramento and Unions. Our representatives need to wear bandanas when addressing the public, since they are robbing all of us...legally! How in the world is Pasadena going to pay for pension obligations going from 30 to 80 million in the next 2 decades? Sierra Madre's numbers are between $10M and $40M. Depending on how CalPERS investments perform. In case you're wondering why they're really selling the property from under the library. The biggest bandit is Gov. Brown. I just got my car tag fees for October. Cost went waaaay up for my 10 year old vehicle and I can't wait to pay the new added gasoline taxes beginning in October. I feel like I'm being taxed to death. Is 1:13 biting the hand that feeds him? There is a recall petition on line for a Republican Legislator who was the key vote for that gas tax, the Democratic party made promises for his district that he couldn't refuse. The John & Ken radio DJ's have been supporting the recall efforts. With out this future vote being cast when session begins again in Sacramento; the gas tax will NOT go through. Time to fight back on bad policy makers out to make a quick buck for themselves at tax payers expense. So people not from his district want to recall him for doing a good job in his district? Typical alt rite talk radio babble.......Good for ratings that's all. If you're not from his district it doesn't matter what you think,did that ever occur to you? Not sure why the alt right would want to recall someone from their own political party. In 2:47's simplistic world opposing such things as the wildly exploitative and taxation heavy CalPERS somehow makes you a Trumper. Nothing could be farther from the truth. 1:14, Sen Josh Newman is a Democrat from Fullerton. He is NOT a Republican. He has voted for raising taxes against the will of the people. Sacramento democrats are doing everything in their power to stall the recall. Google Howard Jarvis Association for more information. Only Newman's local constituents can sign the recall form. Parts of Los Angeles are included in being able to sign for the recall, Sierra Madre is not one of those cities. John & Ken are fighting the good fight! Want to beat gas taxes? Drive an electric car. Yes and my favorite bandit, Gov. Brown, signed a bill recently changing the rules of recall.The new law allows voters to withdraw their signature from a recall petition 30 days after they have been submitted to the officials. It effectively adds months to the timeline to certify a recall election for the ballot and insures that nearly all recall elections will be held during the June primary elections. This aids Newman as the turnout is bigger and better for democrats in June. Bottom line is California already has high taxes to repair our roads. But the law has loopholes and the tax dollars are diverted to general accounts, where they are most likely used to pay, who knows what? Bullet train? retirement funds?